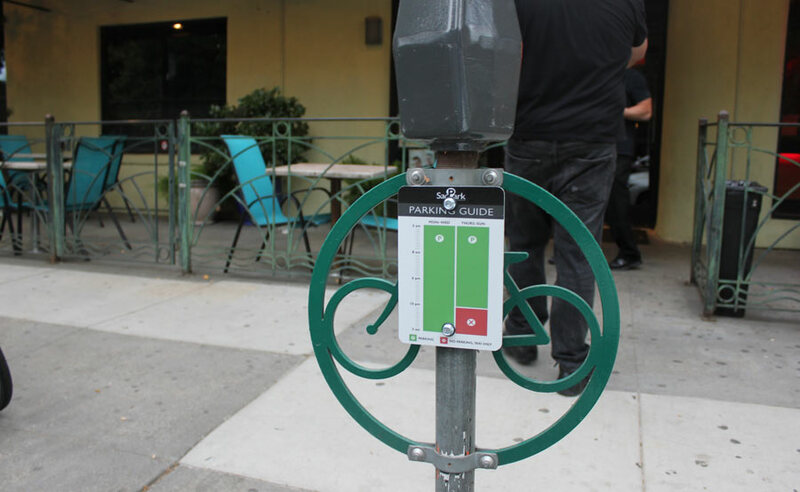 Posting Enhanced Parking Signs in Sacramento - Updated! My NO PARKING signs were a success! I got tons of feedback and great comments from Reddit. Unfortunately, when I visited them a little later, all eight signs were gone. Perhaps they were removed by desperate parkers, drunks or perhaps by a city clean-up crew. Luckily, I still have a laminator! I printed up eight new signs and prepared them for posting. 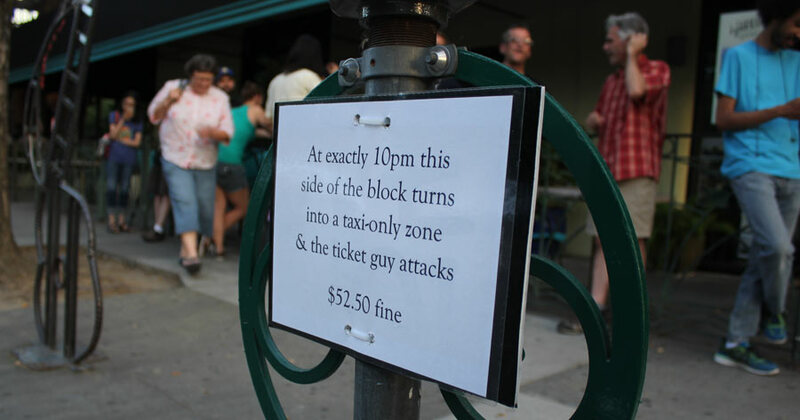 The new signs are identical to the old, except that I changed the end to ...& the ticket guy attacks. Once again, I was a little nervous posting the signs, but it turned out to be fun and once again I was stopped and thanked for my contribution to parking intelligence. 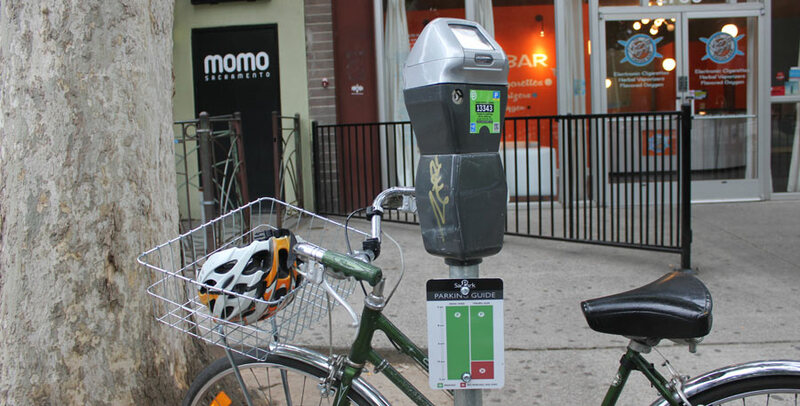 Once again, every parking meter was marked with a plainly worded, homemade sign. My plan from this point was unclear. If this set of signs was taken down, would I put up a third round? Should I change the way I attach the signs, or switch to a new tactic? I wasn't sure. But something came along from the city! 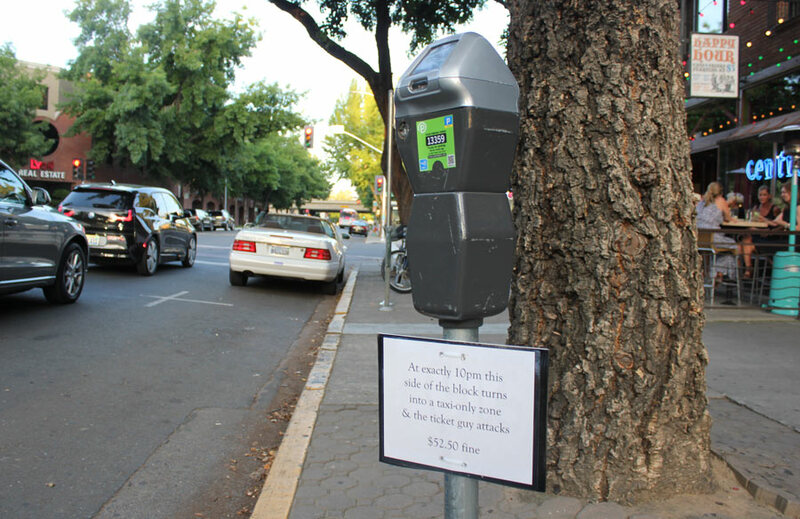 I got a call from the Operations Supervisor of Parking in Sacramento! Apparently he had gotten word of my shenanigans and had been tasked with improving the signage for the one-block taxi-zone hot spot on J Street! They were actually going to do something! He told me that the taxi-only zone was set up to give taxis easy access to customers exiting bars and nightclubs on this block. Before there was a taxi-only zone, the taxis would double-park, blocking J street and making it look like the airport departures lane. 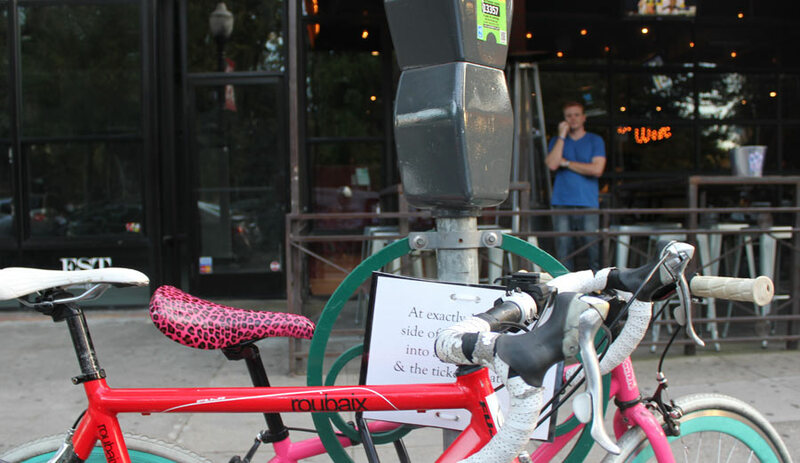 The taxi zone was suggested by the business owners on that block to prevent the collisions and traffic knots that were occuring every weekend. 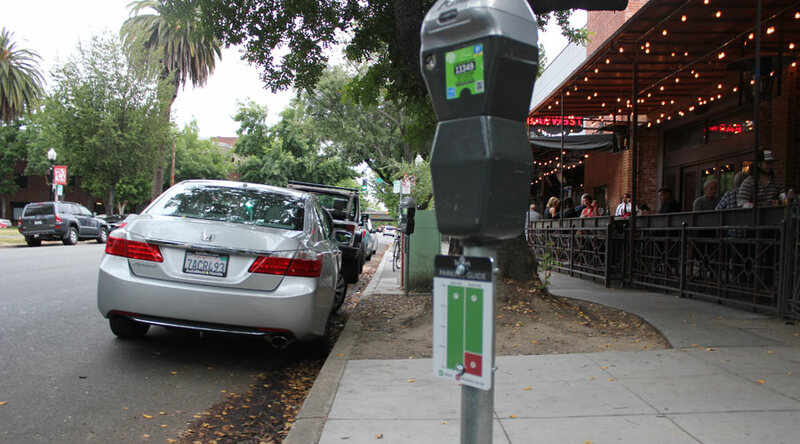 Before the end of the day, offficial new signs were in place on every parking meter on that block. Amazing! They were metal and bolted to the poles. 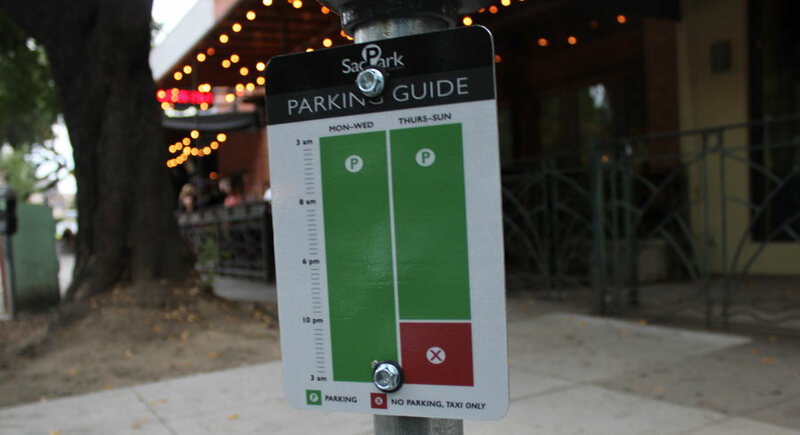 The new signs show the parking hours in an infographic. The parts of the week are split into left and right columns. The red part of the second column highlights 10 pm to 3am, when the block becomes a taxi-only zone. I like the new signs! For one thing, there are a lot of them. Also, the instructions are large and colorful. And, they take a minute to comprehend. That might not seem like an advantage, but they will work if they can shake people out of their automatic pilot when they are looking for a spot at night. Effective or not, I'm thrilled my weird pirate tactic actually worked to make a change! Who knew city government could work like that?